In many regions of the United States, mid-Spring sends thousands of people into our fields and forests to seek the elusive morel. Morels are sac fungi (Ascomycota) as opposed to the classic gilled mushrooms (Basidiomycota) and are considered one of the finest wild gourmet foods out there. Morels have a counterculture all their own with stories of colorful hunters who jealousy mislead would-be pickers to protect a patch. They tell tall tales of the big find, theories on how and where to find them, and leave legions of salivating hikers in their wake. Some locations that have proved successful in my morel hunting are under dying elms, around the bases of ash trees, recent burn areas, and abandond apple orchards. They generally appear after a warming period, especially if it has been wet. I haven’t heard about too many people finding morels in southern Delaware; they seem to be rather rare here or perhaps a well-kept secret. However, I know from experience that northern Delaware, Pennsylvania, and the Great Lake States all have well established picking traditions. Morel habitat? Expect the unexpected and then jealously guard your patch! 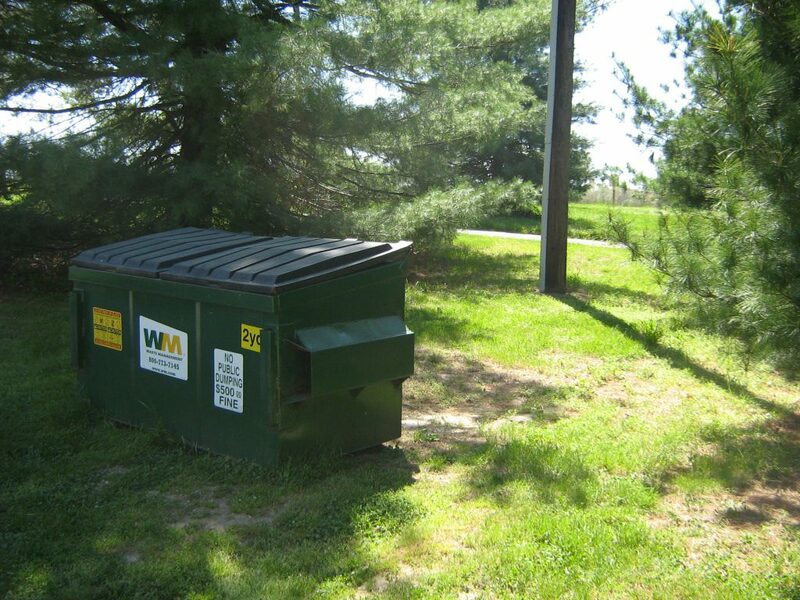 Therefore, we had a nice surprise today when Elliott Workman, Abbott’s Mill Nature Center’s Land and Facilities Coordinator, discovered a patch behind our dumpster under white pines. “One man’s trash is another man’s…mushroom?” They were yellow morels, Morchella esculenta. 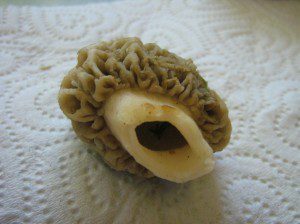 As with all morels, they are readily identified by the brain coral-like head. The pock marks contain spore sacs that are released into the air at maturity. A single fruiting morel may produce hundreds of millions of spores in its brief life. The spores are transported by the wind, ideally to land in suitable habitat. Morels are saphrophytic with germinating spores producing hyphae (root-like filaments) that feed on decaying wood. Morels are also completely hollow in the stalk and head. 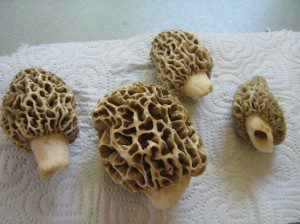 Experienced morellers know to slice the morels in two in order to evict any slugs, beetles, pillbugs, or other critters that may be hiding inside sharing your meal. The simplest recipe is to sautee morel halves in butter. Ah! The taste of spring! A word of caution: Please use common sense when experimenting with wild foods of any kinds. Even “edible” species can produce allergic reactions in certain individuals. Talk to local experts, study your field guides, and enjoy. …but not biting cold and whipping wind. Fourth in a series about the Delaware Nature Society trip to Nebraska in March. Kansas was getting stirred-up with 40 and 50 mph winds and received a foot of snow the day we visited the Rainwater Basin in south-central Nebraska. Looking on the weather map, I realized we were three counties away from blizzard warnings. This is enough to give a trip leader nervous fits. Luckily, we got away with mere cold and wind. A better name for the Rainwater basin on our visit would have been Icewater Basin. 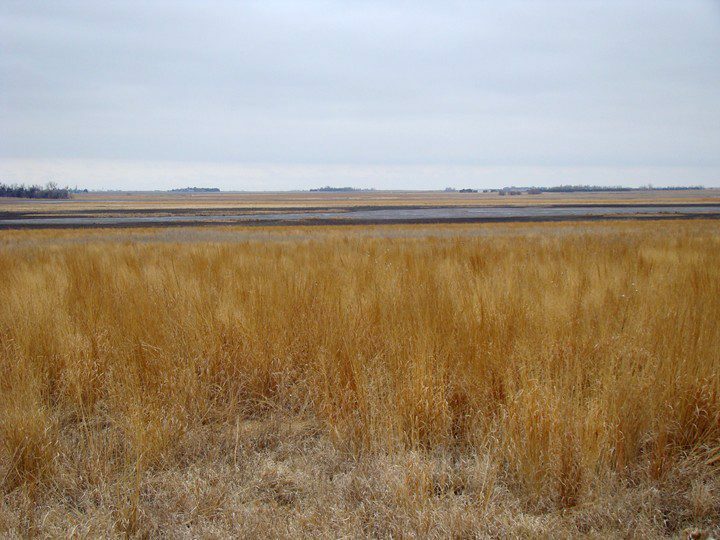 This vast area of south-central Nebraska was historically prairie intermixed with low-lying shallow marshes. Now it is mostly cornfield with some of the larger wetlands preserved through the U.S. Fish and Wildlife Service. 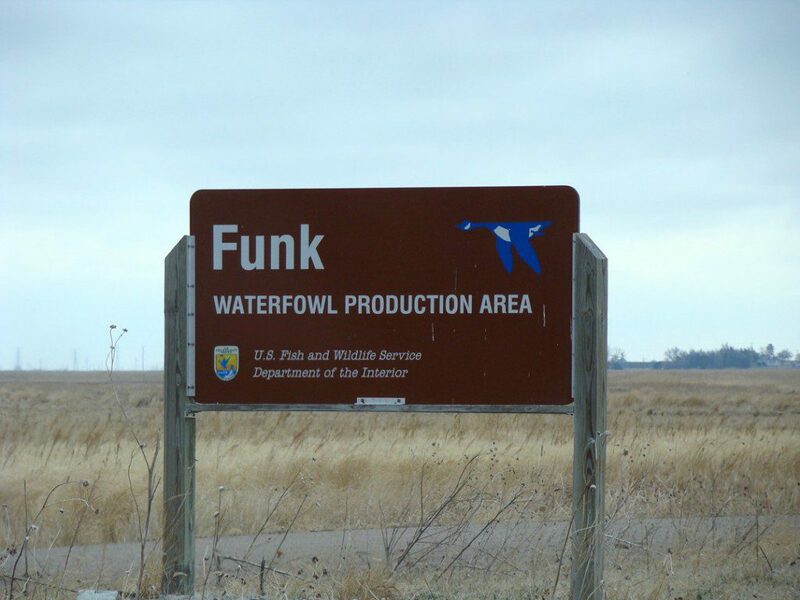 Our destination for the morning was Funk Waterfowl Production Area. 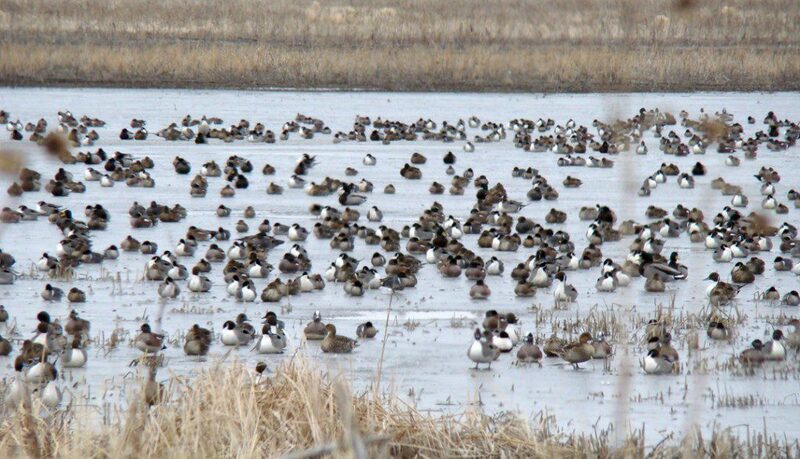 Funk Waterfowl Production Area is one of the biggest wetlands remaining in the Rainwater Basin. Cold was how it looked as we drove to Funk. Chilly duck feet stood on the ice when we arrived. Biting wind was in our faces. 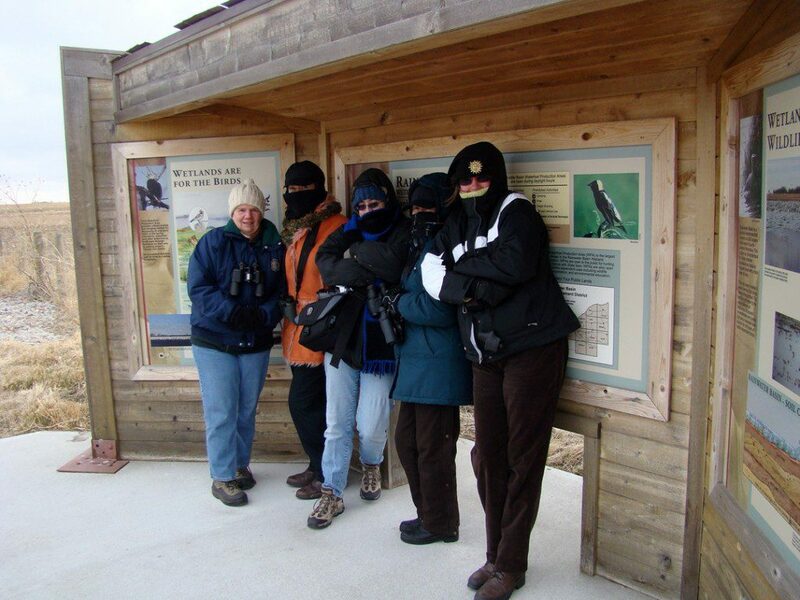 Freezing fingers gripped binoculars. Bleak was the thought of spending the day outside. Wintry air was reluctantly breathed. Cold-blooded was how we felt. An executive decision was made…watch birds from the van! Baird’s Sandpipers had arrived on-time to the Rainwater Basin, but wintry winds ruffled their feathers as they fed in the icy mud. A Northern Harrier switch-backed into the gale, listening for the shivery movement of a hunkered rodent. Thousands of ducks, mostly Northern Pintail, American Wigeon, Mallard, and Green-winged Teal were unresponsive when we approached. They eyed us and were leery, but most opted to quietly swim away rather than take flight into the winds that would have directed them into a sea of inhospitable cornfield. Cold waterfowl swam away from us or walked on the ice instead of flying. One thought warmed us. A Whooping Crane had been seen sporadically for the last few weeks in the Platte River area. The “area” however, was about 80 miles long. Finding a Whooping Crane somewhere among half-a-million Sandhill Cranes would be nearly impossible. Funk Waterfowl Production Area is a remnant of what much of south-central Nebraska was like prior to cultivation…prairie and marshland. Lunch in a warm building was very, very welcome. Afterwards we went on a driving tour of the Platte River floodplain to view cranes feeding, dancing, flying, calling and whatever else that cranes do on such a frosty day. The weekly Abbott’s Mill Nature Center walk yielded some great birds last Wednesday morning as we close in on the magic month of May. With chilly winds and the sun playing peek-a-boo, we started our walk at the Lindale Tract. This woodlot borders Abbott’s Pond and features both swamp and upland forest, making it a great spot to find birds. A pair of drake Wood Ducks swam near an observation deck and two Eastern Kingbirds chattered as they flew along the pond edge. Yellow-rumped Warblers were abundant and we were able to find a secretive Pileated Woodpecker. We took a short drive over the Blair’s Pond Preserve access and scanned with our eyes and ears for the yet to arrive Baltimore Orioles. Last year’s nest is still visible, dangling from a tulip tree. Indeed, they have yet to arrive. However, the trails yielded a great many birds and blooms to enjoy. Ovenbirds, which breed in the preserve, were well represented with a singing male never out of earshot. Despite this, they can be rather difficult to see, even from exposed perches. Along the Paw Paw Trail a few Hermit Thrush revealed themselves amongst shadows in the holly trees with quiet “chuck” calls. Slowly, they characteristically raised and lowered their tails. As we hiked the Savage Trail back to the Post Oak Trail, a familiar, sweet warbling song with a slightly burry edge could be heard through the trees. It was our first Summer Tanager of the year. The single male was perched low in the understory in a flowering dogwood. He remained perched for sometime and offered great looks. After a few minutes, he flew away uttering his “picky-tuck” call. The Scarlet Tanager with its black wings also breeds in the preserve, but has yet to make an appearance. The Post Oak Trail hosted several singing Palm Warblers. These habitual tail-bobbers are one of the earliest warbler migrants in the spring and a few have even wintered at Abbott’s Mill for the past two years. Sassafras trees are currently in bloom and their yellow-green flower clusters coupled with the creamy white flowering dogwoods added another reminder of spring’s momentum. We made our way back to the parking lot, but before we crossed the boardwalk, were heard a tail-bobbing Louisiana Waterthrush and a Northern Parula singing – two more for our warbler list. Our tail-bobbing bird encounters were not yet finished as we spied a small shorebird flying over the pond in a strange arc-winged glide. Upon landing, the Spotted Sandpiper worked the pond edge as he bounced his rump. Just for good measure, we drove back to Abbott’s Mill via Griffith Lake and were rewarded with a Northern Rough-winged Swallow, fairly uncommon in the area. The excitement of returning birds will continue to build over the next few weeks, making this one of my favorite times of the year. If you’re interested, stop by Abbott’s Mill and the Milford Millponds Nature Preserve or join us on our weekly Wednesday walk. 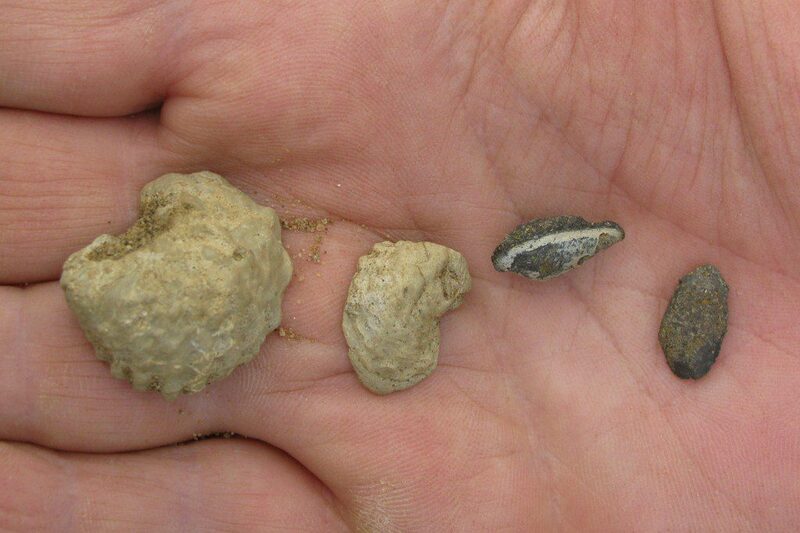 Bullet-shaped Belemnites, a fossil squid, along with an oyster-like Exogyra. The Delaware of 65 million years ago looked vastly different. Instead of forests of trees, there were forests of corals and other sea plants. The entire Delmarva Peninsula was underwater, part of a vast sea full of amazing creatures. Today, we can get a glimpse into the past by searching for fossils from this time, known as the Cretaceous period. Along the Chesapeake and Delaware Canal, piles of sand dredged up from the bottom of the canal are full of fossilized marine animals. We visited this area last week on the Delaware Nature Society Family Fossiling trip. A happy family using a sifting box to sift the sand for fossils at the C&D Canal. 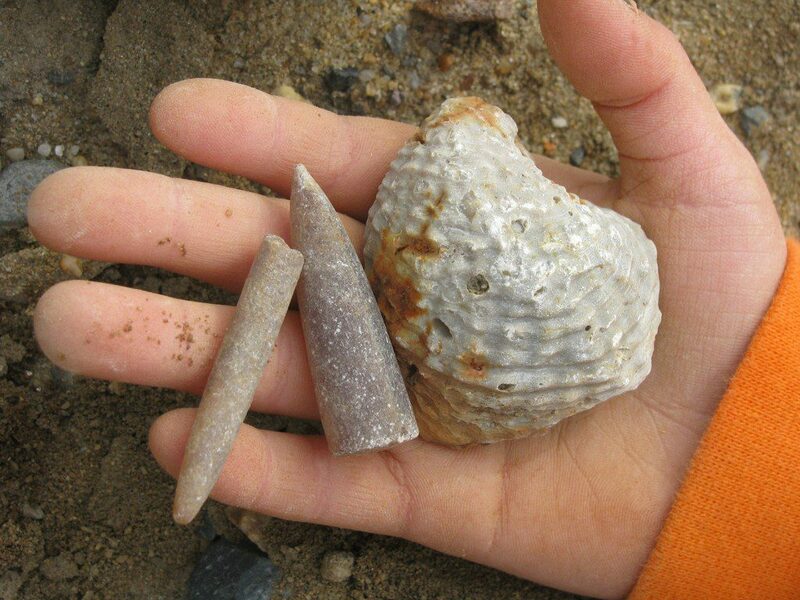 The most-common fossil is the Belemnite, a small squid that roamed the seas during the time of the dinosaurs. These fossils look like amber-colored bullets, with the pointy end being the head of the squid. The Belemnite is the official state fossil of Delaware! A couple of oyster-like Exogyras and snail-like Turritellas. There are lots of interesting mollusk fossils to be found, with corresponding cool names: Exogyra, Ostrea, Grodes, Turritella, and many more. The ultimate prize to find at this location is a fossilized shark tooth. 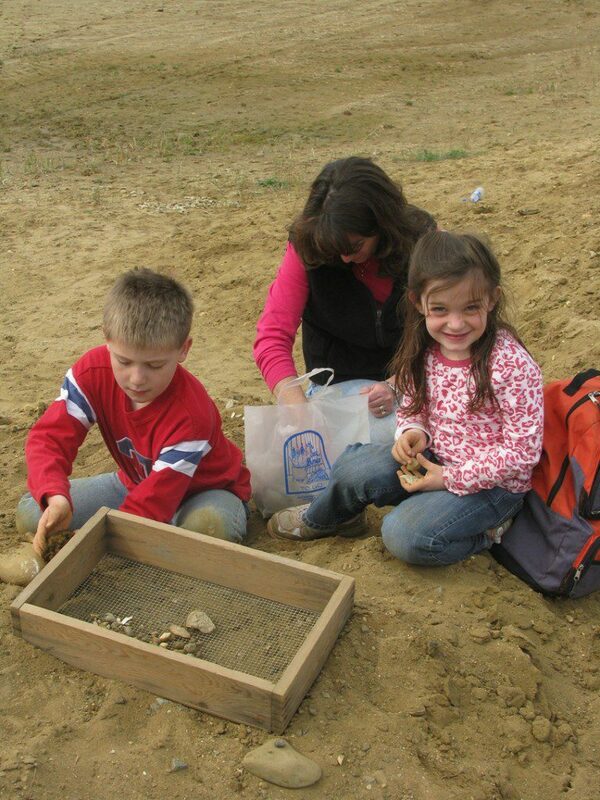 The fun is in the hunt, and the Delaware Nature Society’s family fossiling trips always dig up a good time while seeking signs of the past. Upcoming programs with the Delaware Nature Society: Shenk’s Ferry Wildflower Extravaganza – April 30, Violets of the Red Clay Valley – May 2, Ashland to Coverdale Farm Wildflower Walk and Lunch – May 5, Roger Tory Peterson Celebration – May 5, Wildflower Gardens of Mt. Cuba, Birding Series begins May 8. Visit www.delawarenaturesociety.org.